My voyage started in Tuscany exploring the art movement called the Macchiaioli (see link for blog), then moving south in my native city Naples, I discovered the artists of (see link for blog), the Posillipo School (a seaside Naples� neighborhood) which has now brought me here to this other art movement, to which I feel directly connected and influenced . The so called School of Resina (other name for the Roman city of Herculaneum, famous because destroyed at the same time of Pompeii by Mount Vesuvius)�.So, who were they? What innovation they brought to the Italian art? 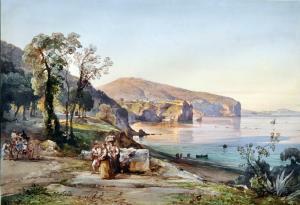 In 1863, by the initiative of a generation of brilliant artists, Herculaneum, then called Resina, a small town few miles south of Naples, on the slopes of Mount Vesuvius, gave birth to the eponymous school, also known as the �Republic of Portici�, addressing the theme of realism and the producer of extraordinarily beautiful works. Together with the School of Posillipo, the School of Resina is the highest representative of the nineteenth century Naples landscape paintings. Even today it�s still uncertain about who and how many artists have been part of this artistic movement, the arguments in this regard are conflicting: from those whom like the De Rinaldis, who would only reduce it to the big names and whom like Emilio Lavagnino who would also like to expand it to the artists closer to the Macchiaioli movement and to the �School of Posillipo� followers. For certainty we can say that four artists were the founders of this renowned School. Marco De Gregorio, the oldest and the only one native of the city of Resina, was joined later by Federico Rossano in 1858. 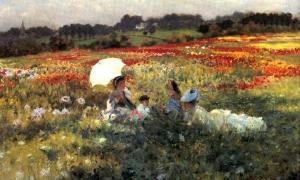 Giuseppe De Nittis, from Puglia, who became the most renowned abroad, finally moving to Paris in 1867. Lastly, Adriano Cecioni, native of Tuscany. As also confirmed by Salvatore di Giacomo, the historical partnership merged in Resina in the decommissioned Royal Palace of Portici, the ancient Bourbon residence, surrounded by greenery, where Marco De Gregorio had his studio. Meeting place of the four and crossroad for the city of Resina and the city of Portici. From there left for outings in search of bucolic places, underbrush views, examples of the life and views to portray; from Vesuvius to the coast to go in the Gulf Islands. It is impressive the simplicity with which De Nittis describes those� happy days �, carefree days spent with his companions, enjoying the excursions around the city that transmitted a sense of freedom. It is extraordinary then the ability to reproduce on canvas and on board all temperate atmosphere of light and southern color. It is the play of light that characterizes the paintings of the School of Resina. The gaze of a newcomer is immediately drawn to the light emanating from these paintings; those landscapes give off a glow that makes them unique. The paintings portray often clich�s, destinations for outings and reflections where a surprisingly modern conception of light. Examples are: Rendezvous in the Forest of Portici, (Viareggio, Istituto Matteucci) of De Nittis, and the picture in the Forest of Portici of Marco De Gregorio, painted in 1875. The light filters through the trees and illuminates patches to the ground, creating a game of reflections and a warm color obtained from mixing with white lead. Adriano Cecioni spoke, with regard to the framework of De Gregorio, of �reasoning� of light, finding in it something no artist had ever done before: the insight to represent the filtered light from a canopy of leafy trees. These were the signs, of the connection with the movement of the Macchiaioli, born in Florence, and based on this new concept of painting. The importance of the light in a painting, they also used to paint outdoors, the same characteristics that we find in the School of Resina. The movement from Tuscany was formed in Florence in 1856 in the small room of the Caff� Michelangelo where young artists were exchanging their ideas, often out by each school and academic rule. In Portici a few years later the same thing happened in the Caff� Simonetti where Marco De Gregorio, Giuseppe De Nittis, Adriano Cecioni, Federico Rossano and others of their followers became linked by an oath of brotherhood and an artistic program, initiated by long reflections made while they were sitting at those tables in the nineteenth century Portici. The central characters for the subjects of their paintings are another element that links the two movements together. The recurring themes that inspired them are predominantly rural with common people that is almost always the poorest. The School of Resina restore the geographical and anthropological view of the lands of the South, a Southern Italy with its countryside, its inhabitants and its farmhouse until then not known by the rest of the country. Their paintings capture scenes of life they lived, immortalizing lower social class groups, giving them vitality and realism through the refined processing of vivid colors just as the characters that belong to it. A solid, intense color is found for example in the framework of Marco De Gregorio: Back on the field. Where paint takes on a particular form of realism rude and sincere. The residents, fishermen, farmers, sharecroppers, the ladies and the urchins are dressed with clothing that make their social role. The same realism we find in all the works of all the followers of the movement, as in the �Fair of Oxen at Capodichino� by Federico Rossano where natural elements such as tufts of grass, pebbles on the sides of the path and the clothes of the farmers together with shadow effects and light entering through the trees, are characteristic of the best School of Portici�s pictorial language. The movement is dissolved in 1874, year of the final return of De Nittis in Paris. De Nittis thus becoming the official ambassador for the School of Resina in Paris, much appreciated by the militants of the Impressionist movement. The Impressionists had in common with the Neapolitan artists the rediscovery of landscape painting, the myth of the artist rebel to the conventions. They painted en plein air with a rapid technique which was used to complete the work in a few hours. Although they would lay their focus on landscapes at certain times of day with different light conditions, was the �light play� prerogative of the Resina�s School that they couldn�t ever achieve, which makes the difference and distinction between the two movements. The impressionists� paintings as realistic and innovative, they were, despite the focus on landscapes at certain times of day with different lighting conditions hardly created the same optical effect, the play of light, which illuminates the Neapolitan paintings, filtering by trees, exploding on the walls of buildings or making magic outlines of people and things. that is the trademark of the School of Resina, which was renamed without any hesitation: The School of Light. With my last blog about the �Macchiaioli� I started this personal voyage into an area of the Italian Art known to very few in the world and for long time even in Italy, but, what these artists did in their generation has casted a very long shadow on how to paint for many artists that followed them reaching even my generation�which perhaps is the last one that has learned in the same way they did from who preceded them. The new (for that time) different way of artistic expression on canvas using not only the techniques learned in the art academies, but, mainly projecting what the artist was �feeling� looking at a seascape or landscape colors, has a generic term �Impressionism�, but as I tried to explain in my previous post, not everything that looks �impressionism� comes from France�.but, this form of art has many fathers in different parts of the world�.and Italy is one of these places�..and in my specific case; Naples, Italy and the artists that came before me. At the start of the 19th century in Naples, the premier representative of landscape painters was the Dutch emigree Jacob Philipp Hackert (1737�1807), the court painter of Ferdinand IV, who seem to be following the tradition of Lorraine. His paintings had a stock arrangement of a nearby tree in a pastoral hill or mountainside, and with distant ruins or a recognizable mountain in the background. Volcano-ridden southern Campania and Sicily had such distinctive peaks. The fortunes of Hackert suffered with the rise of the Napoleonic Neoclassicism and the deposition of the Bourbon kingdom of two Sicilies by the French. In 1815, the painter Anton Sminck Pitloo, (1790�1837) was coaxed to move to Naples. He opened a studio in the Chiaia neighborhood. he preferred to paint outdoors with natural lighting. Posillipo at one end of the crescent shape bay of Naples, was a natural spot that allowed the painters to paint both buildings and water. Some say he was influenced by the visits of Turner (1819�1820) and Corot to Naples, but in general, Pitloo�s paintings are devoid of passionate political or social imagery Pitloo�s favorite vedute was painted out of doors, not in the studio; and was a view of the crescentic Neapolitan shore from his vantage point from the peninsula of Posillipo. In this way his canvas scene included water, the bustling shoreline and docks, and the land across the bay. The vista while somewhat idyllic romanticism; there was also the encroachment of the daily activities of sailors, fisherman, and their families. Like Hackert before him, Pitloo became a professor at the Accademia di Belli Arti in Naples, and was able to influence fellow painters and pupils such as Carl G�tzloff, Giacinto Gigante, Teodoro Duclere, Gabriele Smargiassi, Vincenzo Franceschini, Achille Vianelli, and Consalvo Carelli. 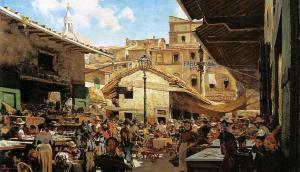 Many of the works of these painter from circa 1820 to circa 1850 are known as products of the School of Posillipo. Other painters influence by this school are Salvatore Fergola, a pupil of Hackert. In time, the lessening of the demands for accuracy and a greater attention to the mood of the painting during the age of Romanticism, led to more impressionist styles found in post-1850s Tuscan school of Macchiaioli (who also painted out of doors), or in the School of Resina represented by painters such as Guglielmo Ciardi. Today I would like to talk about a little of an unknown (or known to few worldwide) era of the Italian Art History, and in specifics the time in between the middle of 1800 to the early 1900. What happened during that time in the artistic world of Italy has influenced many generations of young Italian artists�.including me and artists of my generation. While in France, Monet, Manet, Pissarro, Degas,Matisse etc. lied the foundation of the Impressionism art movement, creating superb masterpiece in Italy, at the same time a similar movement was taking place�but, they were called �I Macchiaioli�. The Macchiaioli were a group of Italian painters active in Tuscany in the second half of the nineteenth century, who, breaking with the antiquated conventions taught by the Italian academies of art, did much of their painting outdoors in order to capture natural light, shade, and colour. This practice relates the Macchiaioli to the French Impressionists who came to prominence a few years later, although the Macchiaioli pursued somewhat different purposes. The most notable artists of this movement were Giuseppe Abbati, Cristiano Banti, Odoardo Borrani, Vincenzo Cabianca, Adriano Cecioni, Vito D�Ancona,Serafino De Tivoli, Giovanni Fattori, Raffaello Sernesi, Silvestro Lega and Telemaco Signorini. The movement originated with a small group of artists, many of whom had been revolutionaries in the uprisings of 1848. In the late 1850s, the artists met regularly at the Caff� Michelangiolo in Florence to discuss art and politics. These idealistic young men, dissatisfied with the art of the academies, shared a wish to reinvigorate Italian art by emulating the bold tonal structure they admired in such old masters as Rembrandt, Caravaggio and Tintoretto. They also found inspiration in the paintings of their French contemporaries of the Barbizon school. Castiglioncello: the Macchiaioli art-movement had one focus in the �school of Castiglioncello� (Etruscan Coast). They believed that areas of light and shadow, or �macchie� (literally patches or spots) were the chief components of a work of art. The word macchia was commonly used by Italian artists and critics in the nineteenth century to describe the sparkling quality of a drawing or painting, whether due to a sketchy and spontaneous execution or to the harmonious breadth of its overall effect. In its early years the new movement was ridiculed. A hostile review published on November 3, 1862 in the journal Gazzetta del Popolo marks the first appearance in print of the term Macchiaioli. The term carried several connotations: it mockingly implied that the artists� finished works were no more than sketches, and recalled the phrase �darsi alla macchia�, meaning, idiomatically, to hide in the bushes or scrub-land. The artists did, in fact, paint much of their work in these wild areas. This sense of the name also identified the artists with outlaws, reflecting the traditionalists� view that new school of artists was working outside the rules of art, according to the strict laws defining artistic expression at the time. The verdict that the Macchiaioli were �failed impressionists� has been countered by an alternative view which places the Macchiaioli in a category of their own, a decade ahead of the Parisian impressionists. This interpretation views the Macchiaioli as early modernists, with their broad theories of painting capturing the essence of subsequent movements that would not see the light of day for another decade or more. In this view the Macchiaioli emerge as being very much embedded in their social fabric and context, literally fighting alongside Giuseppe Garibaldi on behalf of the Risorgimento and its ideals. As such, their works provide comments on various socio-political topics, including Jewish emancipation, prisons and hospitals, and women�s conditions, including the plight of war widows and life behind the lines. The Macchiaioli did not follow Monet�s practice of finishing large paintings entirely en plein air, but rather used small sketches painted out-of-doors as the basis for works finished in the studio. The Macchiaioli were the subject of an exhibition at the Chiostro del Bramante in Rome, October 11, 2007 � February 24, 2008, which traveled to the Villa Bardini in Florence, March 19 � June 22, 2008. Another exhibition of the Macchiaioli was held at the Terme Tamerici in Montecatini, Italy, August 12, 2009 � March 18, 2010. The Mus�e de l�Orangerie in Paris mounted an exhibition of the Macchiaioli April 10 � July 22, 2013. The "Lone Boat", has become an internet sensation! This painting, is the most loved, shared ( on Facebook) and re-twitted among all my works on display on various websites. 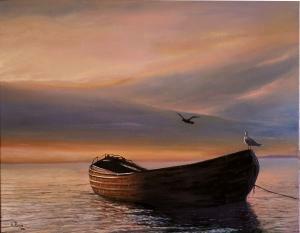 I have to admit, this subject has something magical....this lone boat resting on a calm sea embraced by the warm colors of an Italian summer dusk, and two seagulls stopping by to rest, touched me too. I guess unconsciously I shoot the original photo because I was drawn by the serenity, solitude yet open, acceptance, warmth of what I was witnessing...and now reflected in this painting.